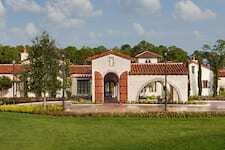 Take a virtual tour of the homes at Golden Oak. At the heart of this exceptional community experience is a selection of luxurious amenities, enriching events and resort offerings available to Golden Oak residents. And throughout the year, Summerhouse hosts a variety of don't-miss occasions for children and adults, many with a theme or seasonal focus. Cradling the serene western expanses of Golden Oak is the Tranquilo Golf Club. Full memberships are currently available to Golden Oak residents for a fee. The picturesque championship course, designed by Tom Fazio, is set in a certified Audubon sanctuary. 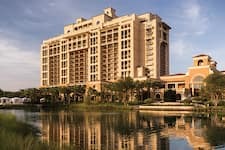 Lush woodlands, varying elevations and wetlands provide a tranquil escape for golfing, as well as a pleasing backdrop to several homesites within our community. 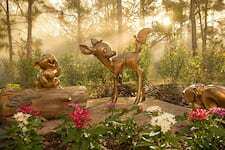 Golden Oak is home to a delightful series of sculptures inspired by the theme of Disney friends in nature. Cast in timeless bronze and sized true to life, the series "stars" beloved characters from classic Disney animated movies. Ariel and friends greet the comings and goings of residents along Dream Tree Boulevard; Bambi, Thumper and Flower are at home near the entrance to Carolwood; and gathered around the reflecting pool in Marceline's Charming Park are Snow White and the Seven Dwarfs along with their adorable forest friends.